Written by V. Ramnarayan, an author and a former cricketer, the first section documents a remarkable journey in Indian advertising. The most absorbing account is of Swamy’s associations with the state-owned enterprises. In the early 1970s, at the height of Prime Minister Indira Gandhi’s experiments with socialism, Swamy helped craft a new identity for companies such as Bhel, ONGC, HPF, HMT, Hec and IPCL. From stodgy extensions of the government monolith, these navratna PSUs were converted into meaningful advertisers. “My greatest contribution is that I have brought in a large number of first-time advertisers both in JWT and in RK Swamy Advertising Associates," Swamy is quoted as having said. Of special interest to both casual readers and those interested in Indian advertising is the 30-page showcase that displays a selection of BBDO campaigns —starting from a 1973 print ad for Bhel to the 2003 “Teacher" ad flim for Raymond Suitings. 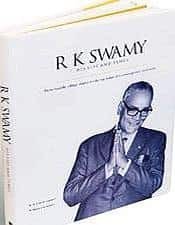 Apart from tracing Swamy’s travails and successes in JWT and BBDO, the narration devotes considerable space to his personal life and philanthropic interests.